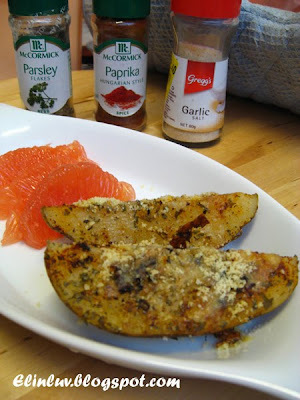 I ransacked my pantry and found these items - garlic salt, dried parsley, paprika and ground black pepper …whoa..perfect for this roasted potato that I was going to make for our lunch. It took me just 20 minutes to cook the potatoes to tender. 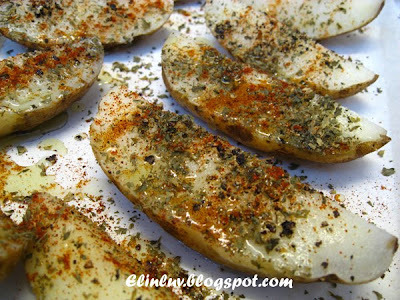 Drain dry and cut them into wedges. Place them on parchment lined tray. Sprinkle garlic salt on them evenly, followed by black pepper, parsley , paprika and drizzle lots of olive oil over them. 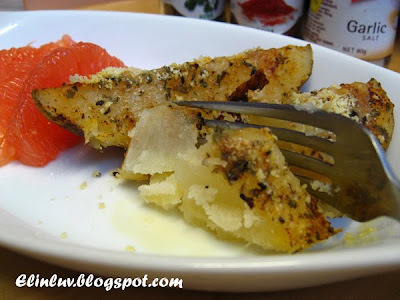 Garnish them with grated mozzarella cheese. 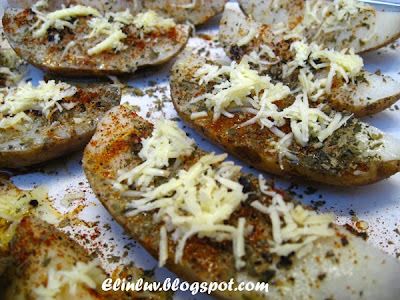 Bakethe wedges in the preheated oven at 200° C for 30 minutes or less until the mozzarella has melted and the potato skins are crispy. 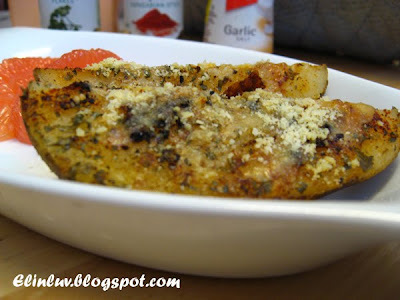 Take out and sprinkle parmesan cheese over the roasted wedges. Simple to prepare and the end result, a tray of delicious flavorful wedges to satiated our hungry stomach. We had this for lunch, with a bowl of mushroom soup out of a tin and grapefruit for dessert. It was a great Sunday lunch for us! the sign of perfection "
hihi..I also cooked potatoes tonight. Quite similar to yours but I only pan fry it with butter till golden brown and added some spices on it. 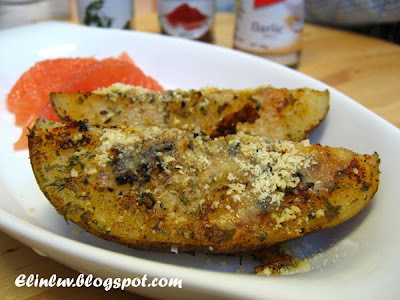 I am not a big fan of potatoes, but your roasted potatoes look so good that I would also love to have some! 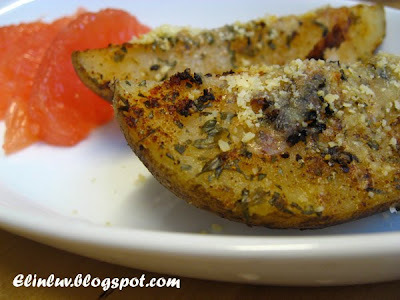 I always wonder what to do with potatoes.this looks so good! how nice, you changed from a restaurant review to a fully functional recipe blog. Very yummy looking potatoes Elin!! My kids would love these. Yum! Looks like it's bursting with flavor! A great alternative to unhealthy fries - just as crunchy and even more tasty! Looks really really good! Can't wait to make these. Btw,I have something for you in my blog. Please feel free to drop by. Thanks & cheers.